A warm welcome awaits you at the Tutbury Road store in Burton on Trent, renowned for it’s specialist ‘Lift & Rise’ Recliner showroom. ‘Lift & Rise’ Recliners offer all the advantages of a conventional Recliner but are also fitted with a full electric lifting and lowering mechanism. To have this facility in your own home can make a huge difference to your freedom and quality of life. An additional choice of single- or dual-motor operation is normally available, where the single-motor action has a 2- or 3-button handset and can often be positioned fairly close to a wall whereas the dual-motor mechanism has more handset buttons for independent control of backrest and footrest and usually offers a much flatter fully-reclined position for sleeping or total relaxation. Both High Seat Chairs and ‘Lift & Rise’ Recliners are often available with other matching pieces so that they look ‘in keeping’ with the rest of the room. The Woburn is our most popular recliner, endorsed also by Which? Best Buy Rise & Recliner Chairs, June 2016, featuring a deep buttoned back and supportive scroll arms. It is available in 5 sizes including a luxurious Grande, to suit larger users and a Low Profile model designed specifically for smaller customers. All models are available in any swatch fabric or leather, and throughout the Winter Sale period, you will receive a free accessory pack, consisting of lumbar cushion, chair back protector and arm protectors. The Hertford lift & rise recliner features a contemporary sleek back and square arm design, with a ‘softer sit’ springing system for added comfort. The dynamic lines of the Hertford complement our new super soft, double tumbled Contempo luxury fabric range. With stylish moulded arms and sleek back the Aston Range of riser chairs offer a contemporary design with a ‘softer sit’ springing system for added comfort. 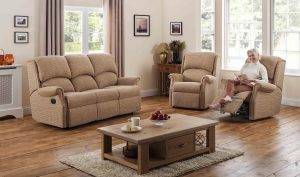 The collection includes 2 and 3 seat fixed and reclining settees, plus matching fixed and reclining chairs with a choice of 5 action options available. 5 year warranty applies. With ‘softer-sit’ springing and a sumptuous two tier fibre-filled back, the Regent represents the ultimate in reclining comfort. The collection includes matching 2 and 3 seat settees, in a choice of fixed or all-action options, plus in both beautiful fabric and fine leather to create a classical suite. The Grande, Standard and Petite matching recliners are available in fabric or leather and the Low Profile riser recliner is available in any swatch fabric. The Pembroke design features a contemporary three tiered, scalloped back and supportive shaped arms, with a ‘softer-sit’ spring system. 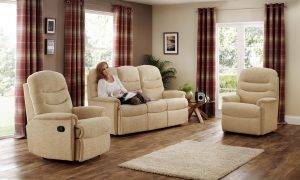 The Collection includes 3 ‘Tailored-to-Fit’ recliners, in all 5 actions plus the Low Profile riser recliner. Matching fixed or reclining 2 and 3 seat settees and a fixed chair is also available to complete the suite.